An Israeli air strike near Lebanon's north-eastern border with Syria has killed at least 26 people and injured about 20, Lebanese officials have said. Israeli planes also struck bridges in mainly Christian areas north of Beirut, while a raid in southern Lebanon killed seven people, security sources said. Hezbollah fired 190 rockets into Israel, killing three civilians. Some rockets also landed near Hadera, 80km (50 miles) from the border, the furthest south Hezbollah has struck. Israel's campaign began three weeks ago after Hezbollah militants captured two Israeli soldiers. Lebanon says more than 900 people have died since then, most of them civilians. Israel has lost 29 civilians and about 40 soldiers. The raid on the Lebanese village of Qaa, on the northern tip of the Bekaa Valley, hit a vegetable warehouse where farm workers were loading produce, local civil defence officials said. The dead and injured, many of them Syrian Kurds, were taken to hospitals in Syria. 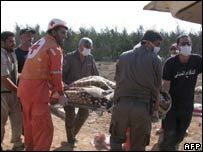 One worker, Mohammad Rashed, told Syrian television: "I was picking peaches when three bombs hit. Others were having lunch and they were torn to pieces." An Israeli army spokesman said the air force had spotted "a truck that was suspected to have been loaded with weapons from Syria". It entered a building which planes then targeted after it left. The number of dead is the highest in a single strike since Israeli planes hit the southern Lebanese village of Qana, where, according to Human Rights Watch, 28 people were killed and 13 are still missing. The Hezbollah strikes near Hadera represent its furthest reach into Israel so far. The rockets landed in open land and there are no reports of casualties. Hadera is some 45km (30 miles) north of Tel Aviv, which Hezbollah leader Sheikh Hassan Nasrallah on Thursday threatened to target if Israel attacked central Beirut. Civil defence authorities in Tel Aviv have warned people to be prepared for a possible missile attack, issuing leaflets to the city's 1.5m inhabitants to advise them how to prepare bomb shelters or protected rooms. 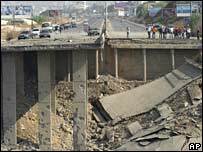 A UN refugee agency spokeswoman told the BBC the destruction of the bridges was a major setback for the aid operation. "Now the main road is basically cut off," said Astrid van Genderen Stort. "We are looking at secondary roads, but they are small. That will delay our operations." The Israeli army said the bridges had been destroyed to prevent Syria from rearming its ally Hezbollah. The continuing violence comes as the Israeli army has been told to prepare for a possible advance in what could be its deepest incursion into Lebanon for more than 20 years. This could see the army push up to the Litani river, 30km (19 miles) north of the border, in pursuit of Hezbollah. At the United Nations in New York, negotiations are continuing on the wording of a ceasefire resolution. US Secretary of State Condoleezza Rice said on Friday the resolution could be passed "within days". Israeli Prime Minister Ehud Olmert has said there will be no ceasefire until an international force is deployed in southern Lebanon.